We had a slight lie-in on Saturday. Thomas Ivor was recovering from his charity triathlon the day before, and the girls had gone to their grandparents for the weekend, so we could get on with some DIY, and thus, unusually by recent standards, I didn't make the Saturday morning 'club ride' from our local shop, Wellingborough Cycles. By lunchtime, we decided to go out for some fresh air and food (a morning's paint stripping had left us needing both, rather badly) and at the last moment I elected to stop by the bike shop to pick up my new saddle, which was my Christmas present and which I'd been meaning to fetch for about a week. We passed the shop and it looked busy - the ride must have not long got back, we figured - and so we went for lunch first, before dropping in for my saddle. As I walked in, something didn't feel quite as normal, and turning round, I saw fewer bikes than usual against the wall, and a sign on one saying 'Closing Down Sale'. 'That's another bike brand no longer worth trying to retail on the high street' I thought to myself, dismissing any notion that it was more than that - but at the counter, proprietor Darren's face was ashen. They'd met the accountants during the week, decided it was impossible to continue trading, and announced the shop's closure to the group ride earlier that Saturday morning. The thing is, it's hard to tell when your local bike shop is in dire straits, because most local bike shops are up against it all the time, these days. Friends in the distribution side of the trade speak of German warehouses mail-ordering products to the UK for less than the 'trade' price, never mind retail. Two tragedies hit us, as with considerable reluctance we picked up a few final purchases to help the guys clear the decks. Firstly, the human perspective. Darren and his team had built something special. They had lovely premises, well cared for, smartly turned out, and unlike certain of their competitors they always took the greatest of care with our bikes in the workshop, most of which had visited them at some time or another. They were a friendly bunch, and again, unlike other shops, never treated us dismissively, disdainfully or like our children were about to explode and kill all the other customers, when we came in the shop as a team. Thomas Ivor, Ruth and Rhoda had grown accustomed to chatting with Darren about their cycling exploits over a sweetie, or a biscuit, and we really appreciated that. It was heartbreaking seeing the personal cost of over a decade's hard work; peoples' livelihoods, being taken away. We appreciated our local bike shop because we knew that a trustworthy, keen, specialist shop close to our home was a luxury these days, and losing that is a tragedy, for us and our community. Of the bike shops in our area, this was the one which had earned our loyalty - it was one we would have travelled to even if it hadn't been the closest. We often contented ourselves with ordering things through them, even if they could be obtained faster and cheaper online, because we saw the value in supporting, in deliberately investing our spending in a business which supported and took an interest in us. At a stroke, it's gone, and it's strangely numbing. My road bike was about to go in for a service, and I have no idea what I will do with it now. I passed the shop yesterday, to go to the butcher's. The shutters were down and, reminiscent of Meg Ryan's character's shop in 'You've got mail', I looked in sadly at the empty shelves, the counter, the window into the workshop where Darren would usually be found working on someone's steed when you arrived - and yet I was reminded of the old lady in the film, the one who'd worked there all her life, saying "Closing the store is the brave thing to do" - and that's certainly true in the face of the odds; sometimes there is no sense in trying to trade your way out of trouble. In this case, the bike trade seems set on destroying award-winning local businesses who supported and nurtured both individual cyclists and cycling culture in our communities - and we won't know what we had, 'til we lose it. Budgets are tight for all of us but we can vote with what we spend. If you still have a 'shop around the corner', look after them. If enough of you do, hopefully they'll still be able to look after you, for some time to come. Amongst our final purchases was a Wellingborough Cycles race jersey, size 'XXS'. It's a shade big on the lad for now, but Thomas Ivor will wear it with pride and it will remind us to hold in our thoughts the people whose labours and friendship we valued, as they move on to new chapters in their lives. 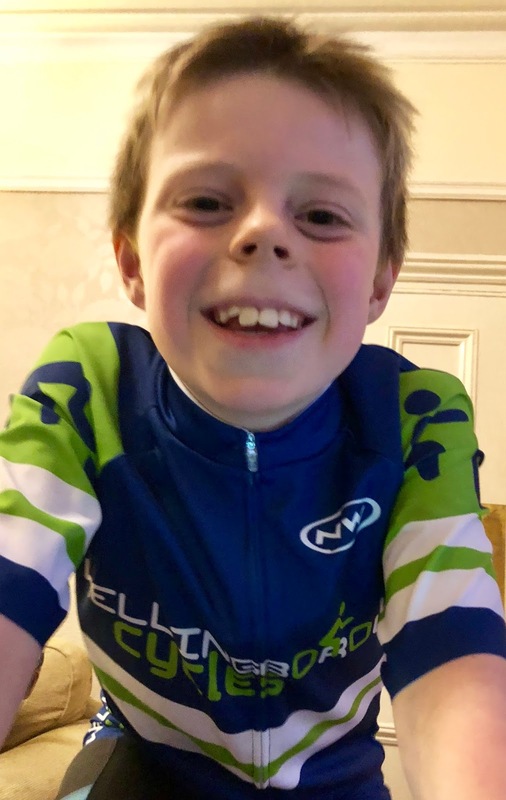 In the case of two of the guys, Tom and James, it's a new way of doing business, because we are pleased to hear that the bike fitting and coaching they offered will be continuing as Vélo Elite, along with ongoing support for our town's de facto cycling club. We thank them for all they have done for us, congratulate them on the memorable things they achieved over the years, of which they should be proud, and wish all of them the very best for the future.